- Easy to refill toilet roll holder. - Environmental premium zinc alloy and unique brass finish, anti-corrosion, anti-oxidation. - Well-designed, vintage and fashionable, add a rustic touch to your bath's decor. - Gorgeous carved pattern makes your house full of elegance and magnificence. - Ideal for using in toilet, bathrooms, bedrooms, and closets. - Suitable for home, hotel or commercial use. 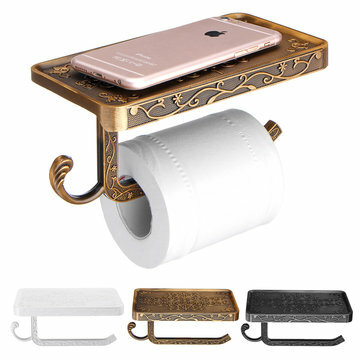 - Good enough to hold mobile phone, key, ashtray, watch, glasses, when you go to WC or have a shower.